How do you feel about endowing green car owners with special privileges like this? I think this is a great idea to encourage people to consider more efficient cars! 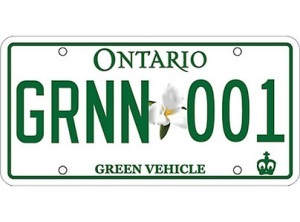 Want to emblazon your ride with Ontario's new "environmentally friendly vehicles" license plate? There are two hurdles you'll have to jump. First, wait until next year when the plate actually becomes available on July 1. Second, you'll need to get a car with a plug. According to the Toronto Star, the new green vehicle plates are for plug-in hybrids and battery-powered cars only. Like the Clean Access stickers that were so popular in California, the special plates will allow the cars to drive in high occupancy vehicle highway lanes through 2015 no matter how many people are in the car. Drivers will also get to pull up to recharging facilities at GO Transit and some government-operated parking lots, and will be allowed to park in special spots at some Wal-Marts and at the University of Toronto. The provincial government is offering the benefits as a way to reach Ontario's Electric Vehicle initiative goal of getting EVs to make up five percent of the fleet mix in Ontario by 2020.